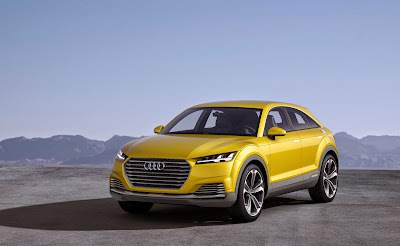 The intelligent plug‑in hybrid concept of the Audi TT offroad concept really shines when driving, making the show car every bit as efficient as it is sporty. The Audi drive select management system offers three driving modes. EV mode gives priority to electric driving. 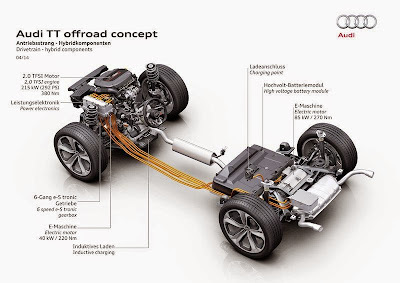 In this case, the front drive unit is inactive, and the electric motor at the rear axle with its powerful torque can rapidly accelerate the four‑door car to a maximum of 130 km/h (80.8 mph). In Hybrid mode, all three drives work together in various ways as necessary. In many situations the front electric motor assumes the role of a generator. Powered by the engine, it recharges the battery and thus extends the electric range. Full system output is available in Sport mode. During “boosting,” i.e. strong acceleration, the rear electric motor works together with the 2.0 TFSI. The same thing happens when the hybrid management system decides that all‑wheel drive is appropriate. In such situations, e.g. on a slippery road or in light off-road conditions, this essentially makes the Audi TT offroad concept an e‑tron quattro.